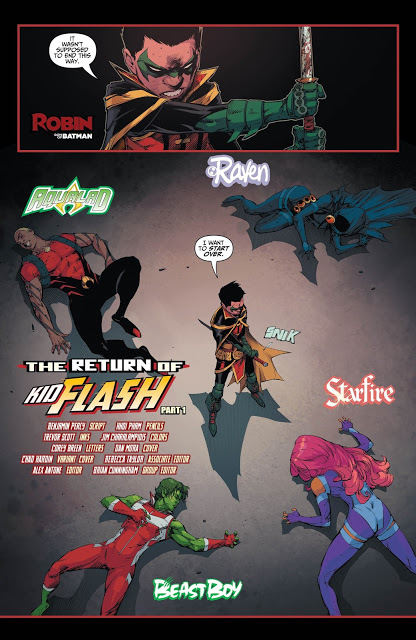 "The Return of Kid Flash, Part 1"
Well, with a story title like "The Return of Kid Flash" I can't help but wonder what's going to happen over the next several months. The Return of Kid Flash sees, well... the return of Kid Flash to the cast, which might feel a bit more impactful had he been gone longer than, what, three months? Far more interesting, is the feeling that the team might be undergoing something of a schism. 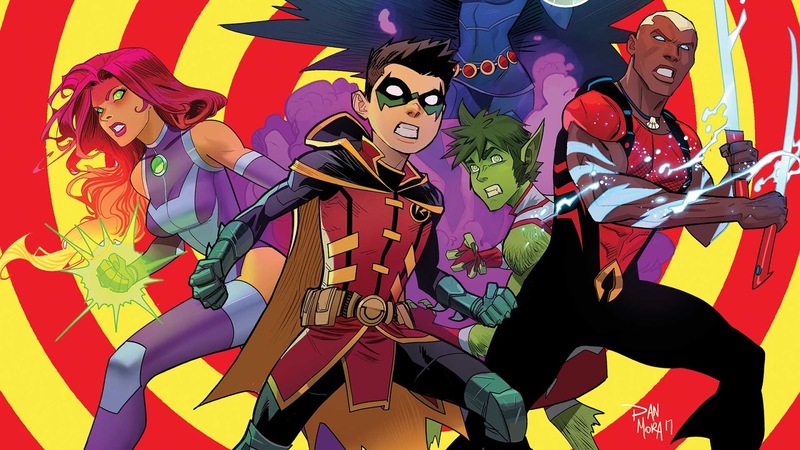 The power struggle that has been in place between Damian and Starfire/Beast Boy over the past several months is ramped up to the point where it looks like we might be heading toward disparate Titan-ic teams. Not only does the team split up for awhile, the story does as well. 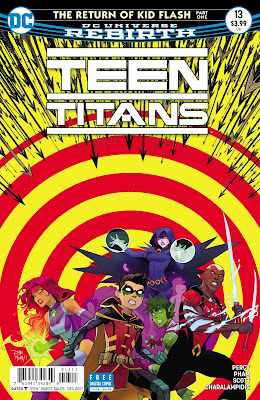 With one being far more enjoyable to read... the one without Beast Boy, who got me all excited there for a moment when he threatened to drink Drano. C'mon Gar, you can't get my hopes up like that! I'm sure it's vegan! Starfire and the gang visit Wally in hopes of him agreeing to rejoin the team... it's really rather annoying. Here's a dude who got them into a pretty bad scrape not too long ago, and now they're nearly begging him to come back. What's more, he says he'll only do so... if Damian apologizes. Good luck, pal. Oh, listen to me... as if Damian won't wind up apologizing when Wally saves his life within the next few issues. The other, far more readable portion of the story involves Damian and Green Arrow's half-sister Emiko. The former is attempting to convince the latter to join the Teen Titans... and, she's not quite feeling it. She comes across as nearly as pompous as Damian, so the dynamic is pretty interesting. I know precious little about the current run of Green Arrow (couldn't make it past the Rebirth issue), so my Emiko-acumen is pretty low. I am looking forward to seeing how their predicament plays out. 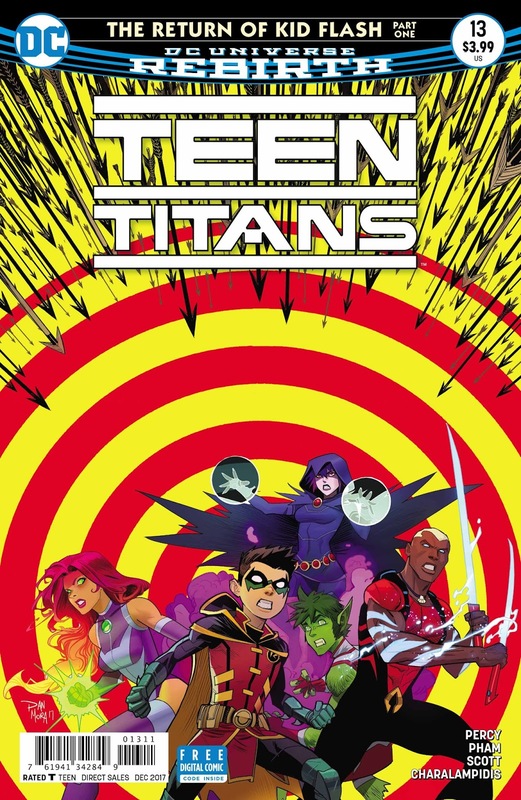 The Teen Titans still have no heart. Any significance the issue has feels predicated on inflating the importance of nu-Wally's return, and that feels completely hollow and artificial. 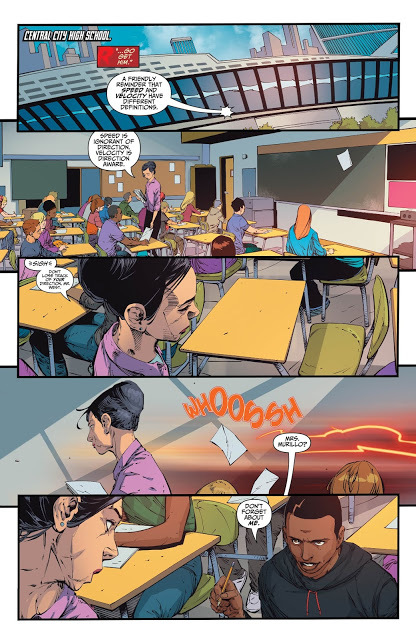 The Damian and Emiko scenes do all of the heavy-lifting here.